My Blogging Advice? Bloggy Boot Camp Baby! I have been blogging for 4 years now but that doesn’t make me an expert, in fact I often still feel like a newbie. I am always looking for tips and ideas to blog better. Blogging conferences are an excellent way to learn new ideas, stay up to date on changing things and make connections with other bloggers. And believe me connections are important! Bloggy Boot Camp San Diego was my first blogging conference experience and I am proud to say I went solo. I had to put on my big girl pants that day! Even as I left that day, overwhelmed by the plethora of new information I learned, I knew I wanted to go back to another BBC, to soak in even more concentrated bloggy awesomeness! I always recommend Bloggy Boot Camp (BBC) when asked about blogging conferences. Don’t get me wrong BlogHer was fun and Blissdom was awesome but I think the best 1st conference for bloggers is Bloggy Boot Camp. It’s Small. They limit it to 100-ish attendees. This works great for making connections and not feeling overwhelmed, especially if you go solo! It’s a traveling circus! Well it’s actually a traveling blogging conference. BBC is hosted in several cities each year. Making it likely that one of the stops will be near you! Registration is only $99. Let’s be realistic, most bloggers don’t make a lot of money blogging (if at all) so spending several hundred dollars just to register isn’t always feasible. It’s jam packed! It’s a super concentrated wealth of blogging and social media knowledge packed into ONE day. P.s. 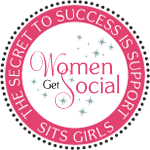 If a blogging conference isn’t in the cards for you right now (or even if it is), definitely check out the SITS girls. They are all about supporting and learning from fellow bloggers! « Officially a Soccer Mom!!! You have my vote!! Hope you win this trip, so you can visit me in Vegas!!! I plan on going, I hope you win so we can see eachother there! I would love to see you there! Fingers crossed! I am planning on BBC Vegas, baby!! I would love to meet up with you if we are both there. It will be my first conference, and I was thinking it would be a good choice as my maiden voyage for all the reasons you listed above!